I can’t think of a sweeter way to mark my comeback. 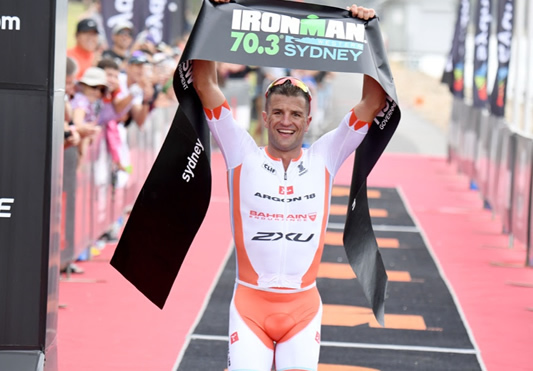 Ironman Western Australia was always going to be a little hit and miss, but I am so happy I managed to hang tough and dig deep to come away with the Victory! There were big question marks over a bunch of things which meant everything was going to have to roll my way through the race, well at least I would have to pull out all the stops and use every bit of experience and all those miles that were in the bank from all my years of training and racing. Would my head hold together? Would my Achilles hold together? What was going to happen after 21km of running seeing though that was my longest run and that was done last weekend? And did I remember how to race an Ironman…??? I pushed hard off the start of the swim to see if I could get clear of the group. At 500m I looked over my shoulder and saw that I had a small gap. Leading the swim is quite foreign for me, usually I am on the feet of the leader but this was a great opportunity to see how I could handle the 3.8km swim solo. I managed to slowly work my way to a minute lead coming into T1. Heading onto the bike and the legs felt good. The power was coming out as expected. At 20km I got a bit of a surprise when Cam Wurf rolled past, I was hoping to have a little more of a buffer on the ex pro cyclist, but he had a great swim with the group and was doing some serious damage to the field. I thought about riding with me… for about 1 minute then I decided to stick to my plan and back that my numbers would get me to the finish in the most timely way. His lead over me kept opening through the bike and fortunately our lead on the field was opening at about twice the rate. Off the bike he had 4 minutes on me and on reflection I am pretty happy to have come off in relative contention with the strongest cyclist currently in our sport. Onto the marathon and ticking through the first few kilometers quite well I thought I would be eating into my deficit, but Wurf was holding even and again I had to back myself that he would slowly come back to me… at some stage! Patience, while not one of my strong personality traits paid off out there and at 30km I had made up the 4 minutes. Boy oh boy did things start to hurt next level at this point, my legs felt like all power had gone and I was worried a little walk was due any minute. As in life, the highs and lows of a race are always there and working through those low patches is what makes the highs so much sweeter. I gritted my teeth and dug deep in the well to open a gap and build my lead over the closing 10kms. Breaking the tap and winning for the third consecutive year here in Busselton put all those struggles over the past 5 months into perspective. I was very fortunate to have my physio and good friend Tawhai Whitewood up here with me, he made sure my body was in working order… with a few strips of tape to hold things together, but we got through it! Up to Bahrain for the 70.3 this weekend. I am really hoping that I can get the body recovered enough to get on the startline, I guess the next 3 days are going to be crucial!! !